(CNN) -- North Korean leader Kim Jong-Il expressed "great satisfaction" Sunday after his reclusive state launched a long-range rocket, according to state-run media. Conservative activists protest the North Korean rocket launch on Sunday in Seoul, South Korea. The North Korean government insisted the Sunday morning launch was a peaceful launch of a satellite into orbit, but the United States, Japan and other nations have deemed the move an act of provocation and a violation of a U.N Security Council resolution. Kim observed the 11:20 a.m. (2:20 a.m. GMT) launch from the command center, the Korean Central News Agency reported. "Expressing great satisfaction over the fact that scientists and technicians of the [North Korea] successfully launched the satellite with their own wisdom and technology, he highly appreciated their feats and extended thanks to them," according to KCNA. The North Korean government characterized the act as a successful, peaceful launch of a satellite into orbit. U.S. and South Korean officials condemned the launch as a provocative act. American military sources said the launch was a failure, saying that the rocket's payload failed to enter into orbit. North Korea's news agency, KCNA, said that "scientists and technicians of the DPRK [Democratic People's Republic of Korea] have succeeded in putting satellite Kwangmyongsong-2, an experimental communications satellite, into orbit by means of carrier rocket Unha-2 under the state long-term plan for the development of outer space." "We are happy, we are happy," said Sin Son Ho, North Korea's ambassador to the United Nations. "It was successful." Officials from the North American Aerospace Defense Command, or NORAD, and the U.S. Northern Command countered that the rocket's payload cleared Japanese airspace but later fell into the Pacific Ocean. "No object entered orbit and no debris fell on Japan," the statement added. "NORAD and [the Northern Command] assesses the launch vehicle as not a threat to North America or Hawaii and took no action in response to this launch." It is unclear whether the rocket's payload was a satellite. The United States and South Korea had disputed North Korea's claims that the rocket would be used for a peaceful satellite launch. A number of countries expressed concern that the launch could be a missile with a warhead attached. An emergency meeting of the U.N. Security Council concluded Sunday without an official reaction to North Korea's launch. "Consultations will go on among members to see what is the appropriate position that the council will take," said Claude Heller, the current head of the council's rotating presidency, and Mexico's U.N. ambassador. When the council would reconvene wasn't clear. President Obama, in what may be the most significant international crisis since the start of his administration, was quick to condemn the launch. "Now is the time for a strong international response," Obama said in a speech before a huge crowd outside the medieval Prague Castle in the Czech Republic. "And North Korea must know that the path to security and respect will never come through threats and illegal weapons. All nations must come together to build a stronger global regime. That's why we must stand shoulder to shoulder to pressure the North Koreans to change course." In a statement after the launch, Obama said, "With this provocative act, North Korea has ignored its international obligations, rejected unequivocal calls for restraint and further isolated itself from the community of nations." The rocket -- launched at about 11:30 a.m. Sunday (10:30 p.m. ET Saturday) -- was a "provocative act in violation" of a Security Council resolution on North Korea's weapons program, State Department spokesman Fred Lash said. 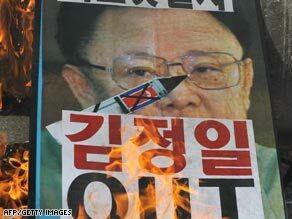 An October 2006 resolution condemned North Korea for missile launches in the summer and a nuclear test that month. Japanese Chief Cabinet Secretary Takeo Kawamura said his country's military was not forced to intercept any missile, which it had pledged to do if necessary. CNN correspondent Kyung Lah said that Japan is "breathing a sigh of relief." Kawamura said his government's position is that even a communications satellite would be in violation of the Security Council resolution, saying Japan "formally denounces" the move. A representative for U.N. Secretary-General Ban Ki-moon said he "regrets that, against strong international appeal, the Democratic People's Republic of Korea [DPRK] went ahead with its planned launch. Given the volatility in the region, as well as a stalemate in interaction among the concerned parties, such a launch is not conducive to efforts to promote dialogue, regional peace and stability." Chinese and Russian officials had a softer response, calling for restraint and calm. Russian officials also appeared to differ from the U.S. military in terms of their assessment of the launch's success. "North Korea sent an artificial satellite into an Earth orbit on the morning of April 5. The parameters of the satellite's orbit are being specified now," Russian Foreign Ministry spokesman Andrei Nesterenko said in a statement on the ministry's Web site. The South Korean president's office condemned the launch, calling it a "serious threat" to world peace, the state-sponsored Yonhap news agency reported. "We cannot withhold our regrets and disappointment that North Korea has caused such a serious threat to peace on the Korean Peninsula and in the world by firing a long-range rocket when the entire world is joining efforts to overcome the global economic crisis," presidential spokesman Lee Dong-kwan said, according to Yonhap. Earlier Sunday before the launch, South Korea's national security council called an emergency meeting amid concerns that a North Korean rocket launch was imminent, a presidential representative said. "That means it was able to go through the staging event," signaling success in the rocket reaching long-range capability. Stephen Bosworth, the Obama administration's special envoy to the six-party talks, said last week that it didn't matter if the North Koreans were trying to put a satellite in space or testing a ballistic missile that could threaten Japan or the United States. U.S. Rep. Howard Berman, chairman of the House Foreign Affairs Committee, issued a statement late Saturday. "It is alarming that North Korea carried out this missile launch in direct defiance of the international community," Berman said. "The test is an unnecessary provocation that raises tensions in the region, and I urge the North Koreans to stop using their missile and WMD programs to threaten their neighbors and the rest of the world." CNN's Jie-Ae Sohn in Seoul, South Korea, and Charley Keyes and Elise Labott in Washington contributed to this report.